Robatel has over 60 years of experience designing and fabricating hot cells for nuclear applications. 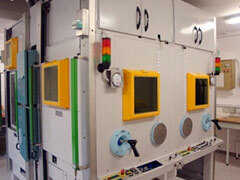 Our hot cells are used for material research, isotope production, and nuclear medicine. 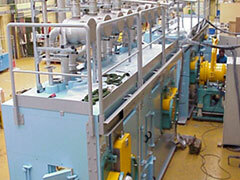 Since 1998, Robatel has completed 36 different hot cell projects. These projects include small single-box cells, large cells with multiple boxes, complex lines with automatic transference from cell to cell, and renovation of existing equipment. Robatel has developed a process of fabricating interlocking lead panels which are assembled more quickly than conventional lead brick. This design allows for the cell to be dismantled and moved more easily than traditional designs. By controlling our own lead pouring process, we assure minimal formation of air bubbles in the panels, and lessen the chance of radiation streaming. As a result of our unique fabrication process, our lead panels provide higher shielding integrity than lead brick. 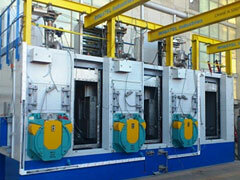 We work closely with each customer to make each piece of equipment integrated to their process. Some cells require rotating airlocks, internal transfer tunnels between enclosures, or docking stations for transportation casks. Our basic approach typically includes engineering design, fabrication, assembly, and testing at Robatel, then dis-assembly, transportation, and re-assembly at the customer site, and final approval testing. In addition to new construction, Robatel offers maintenance and refurbishment services for existing hot cells. Examples include replacement of oil-filled shielded window units, installation of new barrier shields, and refitting of stainless steel inner and outer shells. We are also experienced with extensive equipment modifications requiring drilling and cutting of existing cells to install storage boxes and airlocks.